Many of the vacationers who can’t get enough of camping in the wild also love visiting Walt Disney World year after year. Lucky for them, Disney’s Fort Wilderness Resort & Campground offers the best of both worlds, providing a sprawling 750 acre pine and cypress forest for them to enjoy. Naturally, you can drive your camper or RV down to the resort and rent a campsite at a fair price, but consider the alternative. Why not stay in a cabin that combines the rugged outdoors with Disney’s creature comforts? The Cabins at Disney’s Fort Wilderness Resort will certainly not disappoint, and the following are seven reasons why you will love staying there. 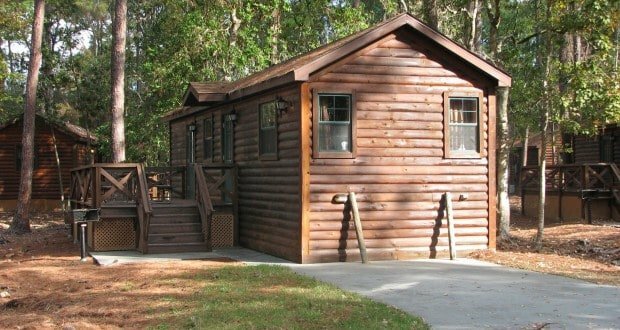 The Cabins at Disney’s Fort Wilderness Resort provide plenty of space for a party of up to six adults. In addition to a bedroom with a queen-size bed and a set of bunk beds, the living room holds a sofa bed. There’s plenty of space for kids to play inside or outside on the deck or in the yard. Speaking of space, cabins are situated a comfortable distance away from each other, giving occupants the kind of privacy that isn’t readily available in crowded hotels and resorts. Each cabin offers a full kitchen with modern appliances, dishes, and utensils, opening up a wide of array of dining options for guests staying here. Grill masters will appreciate the outdoor grill when they want to throw some meat on the barbecue. If you have access to a vehicle, then you can drive to a nearby grocery store to stock your shelves and refrigerator. Otherwise, you can preorder groceries, and cast members will do all the work for you. Upon arrival, you’ll find your kitchen already loaded with fresh food when you order ahead of time. The best part of the deal is doing dishes; you can do them if you want to, but many choose to leave them for Housekeeping. Just don’t forget to tip the housekeeper for her trouble. Disney’s Fort Wilderness Resort provides plenty of outdoor activities that draw you closer to nature, complete with hot days and mosquitoes laden nights. Just step outside your cabin and you’re in the midst of a forest. Jogging and biking trails snake through the entire resort, and one of them connects to Disney’s Wilderness Lodge, so you have lots of opportunity to get up-close and personal with the great outdoors. The resort also offers the Wilderness Back Trail Adventure, which is a two-hour guided tour on a Segway that provides you with many photo opportunities. But the rustic atmosphere of the resort and its rugged closeness to nature aren’t the only ways you can experience the outdoors. There’s plenty to explore on the water. Though The Cabins at Disney’s Fort Wilderness Resort delivers the frontier spirit, it can be difficult to connect with nature with so many people around. The solution may be renting a motorboat, canoe, or kayak to explore the resort’s waterways and Bay Lake. There’s plenty of quiet, remote areas around the lake to unwind from the flurry of activities your family has enjoyed at the theme parks. If fishing is your thing, then professional anglers will gladly provide you gear and lead you to bass-rich fishing holes. But the water not only offers fantastic recreation, but also speedy transportation. When you’re ready to make the journey to Magic Kingdom, a ferry boat will transport you there quicker than a bus full of tourists. After spending time kayaking around the streams that cut through the resort, you may want to head to Tri-Circle-D Ranch for some horseback riding. Parents with children too young and small to handle a horse have the option of leading their kids on a jaunt atop a petite pony. Children nine and older can join the adults for a horseback ride through woodland trails full of wildlife. For those who aren’t in the mood for jumping in the saddle, but would appreciate a pleasant, horse-drawn tour of the countryside, Disney’s Fort Wilderness Resort provides wagon and carriage rides. It’s a way to experience frontier-type transportation without earning saddle sores in the process. Guests staying in the cabins will have a chance to spend some time with Chip and Dale! Chip ‘N Dale meet with guests at their Campfire Sing-A-Long, so bring chocolate, marshmallows, and graham crackers to make s’mores around the fire. You may want to warm up your singing pipes since a cowboy guitarist leads the crowd in campfire songs. After the sing-a-long, a Disney movie is shown under the open sky, so be certain to bring something comfortable to sit or recline on while watching. This western themed show features singing, dancing, comedy skits, and all-you-can-eat fried chicken and smoked barbecued ribs. Refills on draft beer, wine, and sangria for age-appropriate guests and soft drinks are included in the price. The show is just as delicious as the meal and hilarious, too. The performers even wander through the dining hall, interacting with guests and poking fun to everyone’s delight. Even though this two-story facility is pack full of tables, there isn’t a single bad seat in the house. This popular show sells out quickly, so making reservations in advance is important if you want to get in. If you manage to catch the Hoop-Dee-Doo Musical Revue during your stay, you can be guaranteed to a good time. D.W. Noonan was blindsided by the magical universe of Walt Disney when he married a dedicated Disneyphile in 1994. His wonderful wife dragged him into countless days of binge-watching great Disney films. As children began showing up in the Noonan home, D.W.'s growing passion for all things Disney led him to vacationing with his family in Walt Disney World each year and taking a journey to visit Disneyland. He is especially proud of his two teenage daughters, who danced for Disney Performing Arts at Walt Disney World in 2015. Though D.W. lives in Maryland, he longs to hear these familiar words when he returns to the resort: "Welcome home."